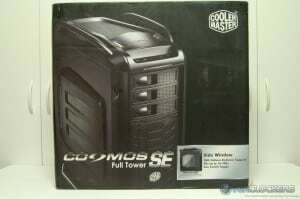 It’s another Cooler Master release date! 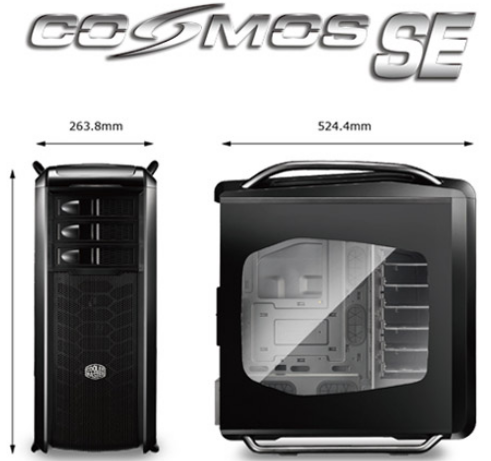 This time around, Cooler Master has a new member of the Cosmos family of full tower cases – the Cosmos SE. 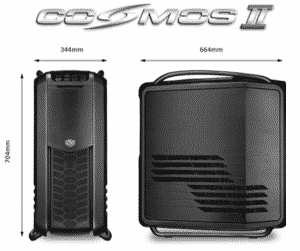 When compared to the Cosmos II, we have a full tower offering that is a little smaller in stature, but still appears to be loaded with features. The Cosmos SE sports a classic design with aluminum handles and is said to be well equipped for the water cooling enthusiast. 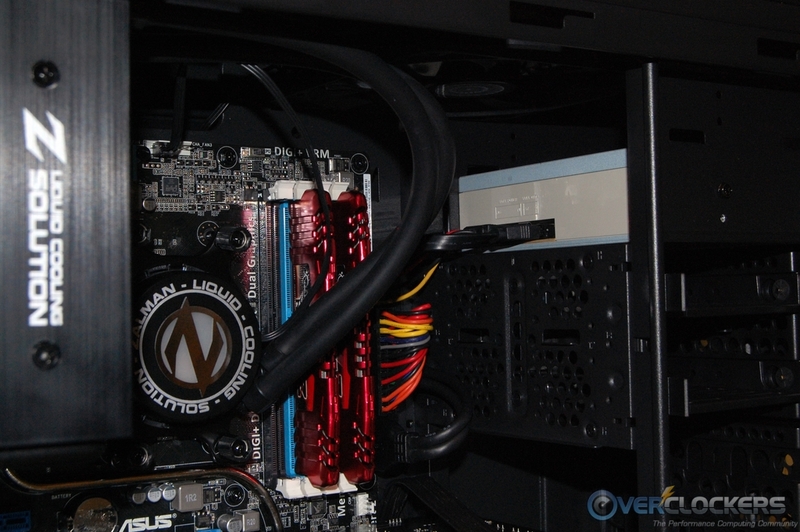 So, let’s dive in and find out what Cooler Master has in this latest Cosmos offering. Here are the specifications for the Cosmos SE as provided by the Cooler Master website. 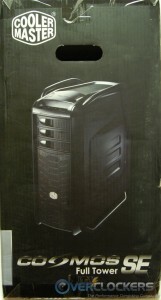 Let’s move on to features, also provided by Cooler Master. We’ll start with the high level features listed below. 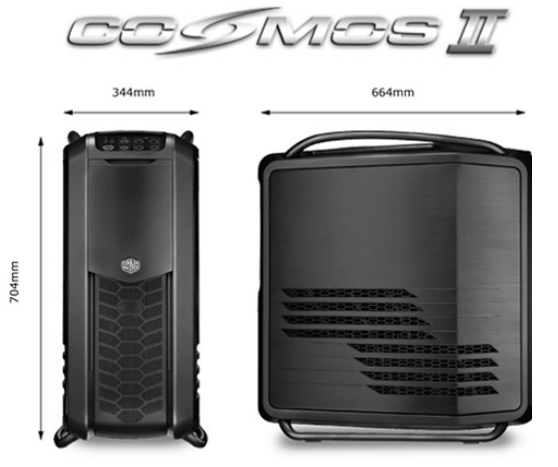 As I mentioned earlier, the Cosmos SE is a little smaller than the Cosmos II as seen in the two images below. 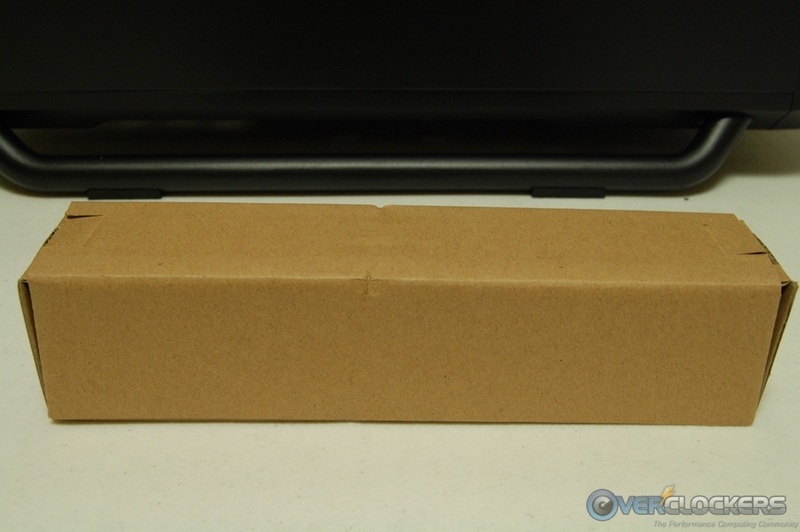 The first image is missing the overall height dimension, but it’s 569.4 mm. 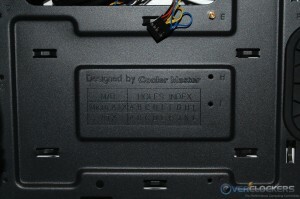 The first set of features below gives you a sense of the room available inside the chassis. 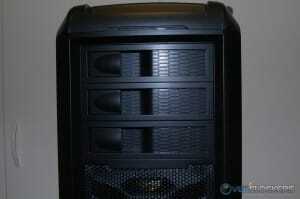 We have support for large video cards, lots of HDD bays, and a 240/280 mm radiator at the top panel. 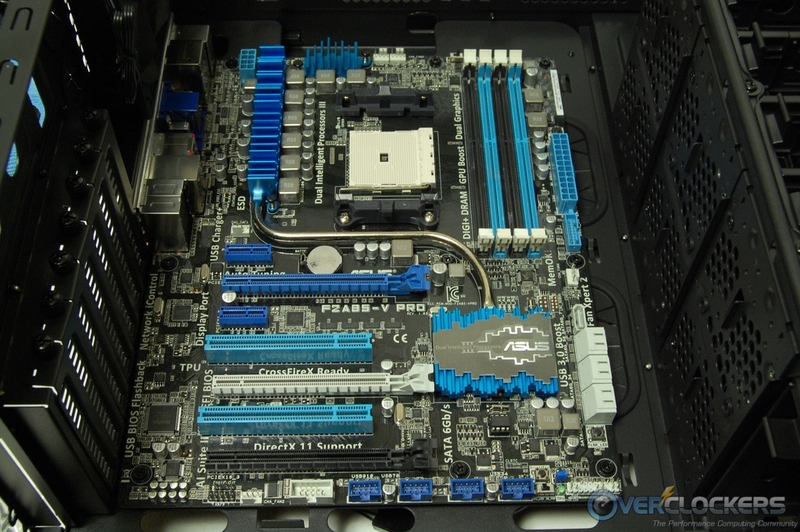 A bottom slide out filter, lots of cable management room behind the motherboard tray, and a versatile I/O panel are a few of the high level features. 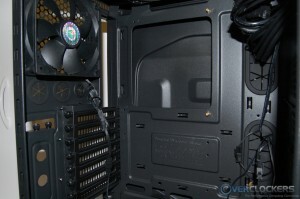 Whether you decide to go with air cooling or take advantage of the available water cooling options, the features below will give you an idea of what options you have to choose from. 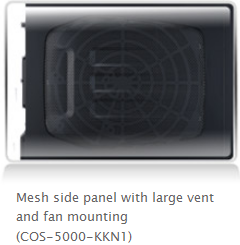 In order to take advantage of the side fan shown below, you’ll need the “Side Mesh” Version of the Cosmos SE. Today’s sample is the “Side Window” version, so it won’t have the side fan option. 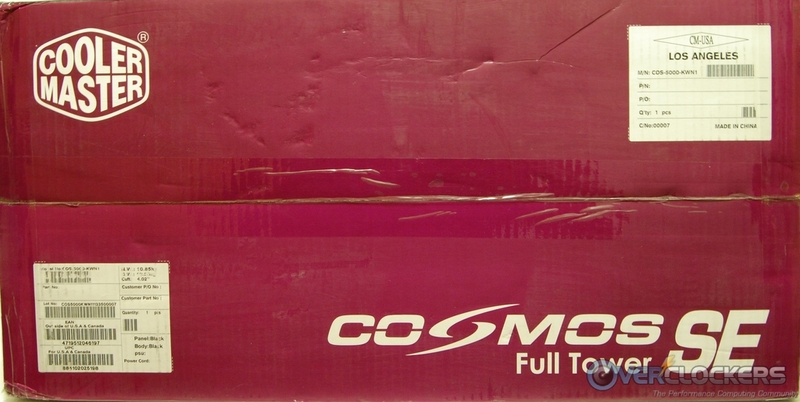 The box does a nice job of giving the potential customer a good amount of information on the Cosmos SE and what it has to offer. The front has a picture of the “Side Mesh” version of the case, but it does let you know a “Window Version” is in the box by way of an emblem located at the bottom right. At the back, we have several of the high level features mapped out, just as we covered above. 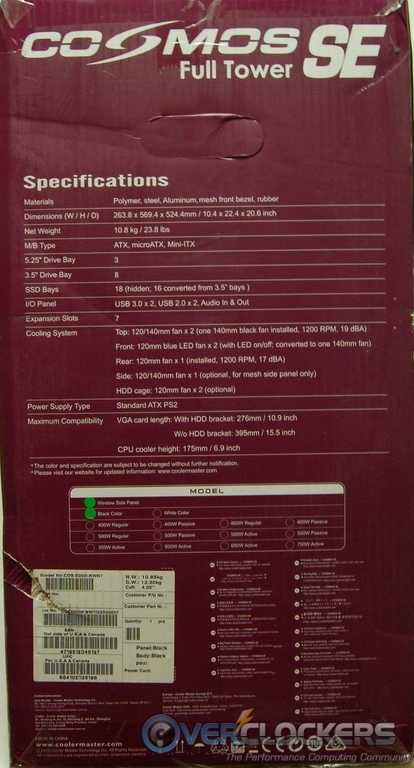 The box sides are home to another picture of the case and the full list of specifications. 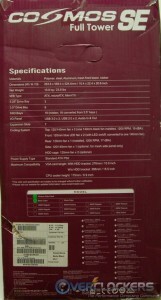 The top of the box is used for additional branding and the product name. 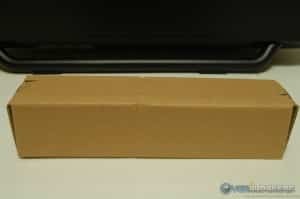 The Cosmos SE is well-protected inside the box by using two Styrofoam blocks and plastic wrapping. 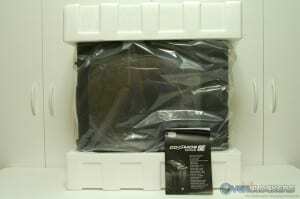 The side window is protected from scratches by using plastic film on both the inside and outside. 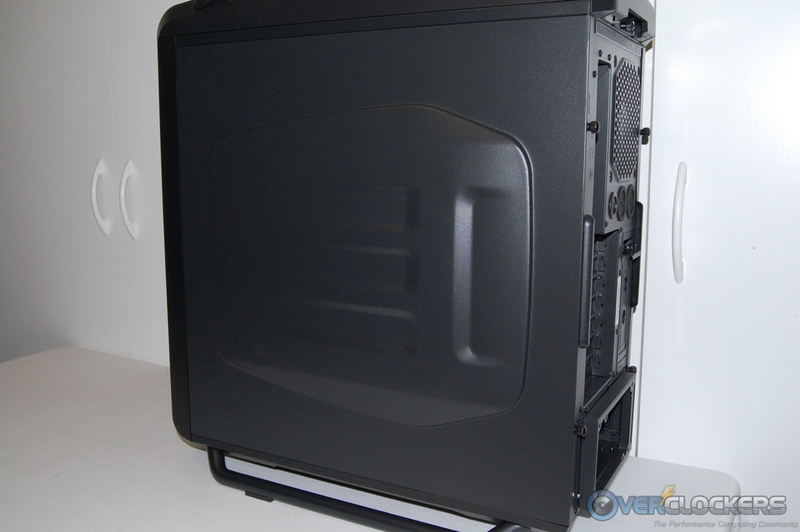 The left side panel on the Cosmos SE has a large window with just a hint of smoke tint to it. 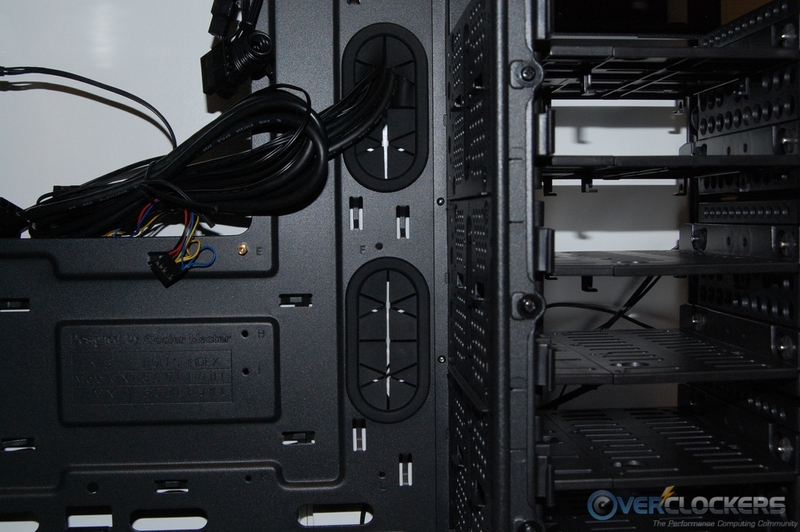 The right side panel has a large bulged out section that should add to the cable management room behind the motherboard tray. 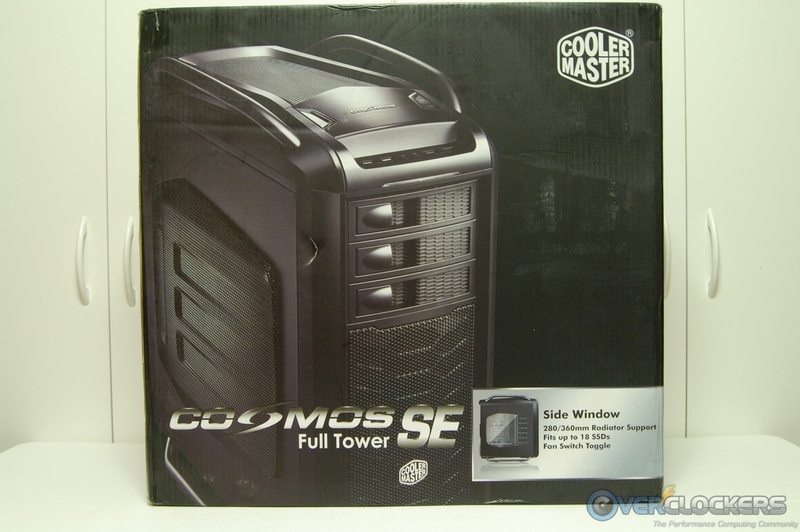 The front of the Cosmos SE has a large mesh lower panel, which also doubles as the filter for the two 120 mm fans behind it. At the top area, there are three 5.25″ bay covers that are solid plastic and do not allow any airflow. Just above the bay covers is a blue LED light bar. 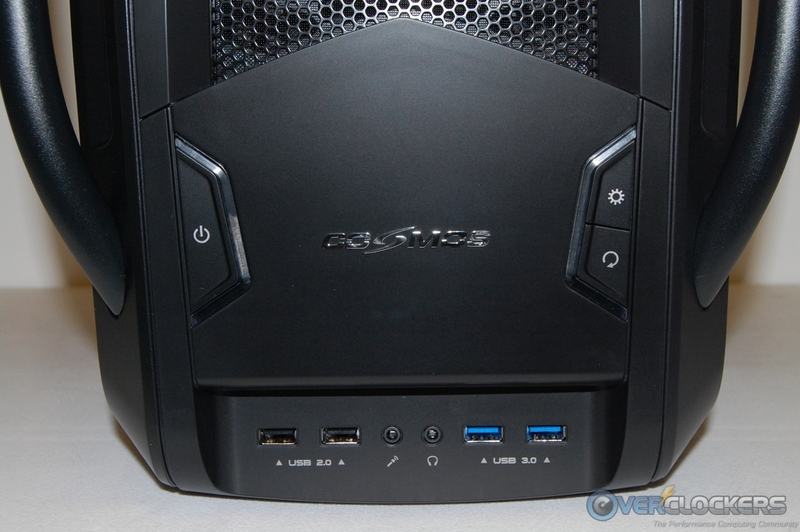 Moving around to the back of the Cosmos SE, we find a bottom mount PSU design, which is pretty much the standard nowadays. 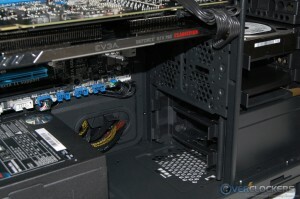 Just above that, we have seven PCI expansion slots with an additional two vertical expansion slots to the right. 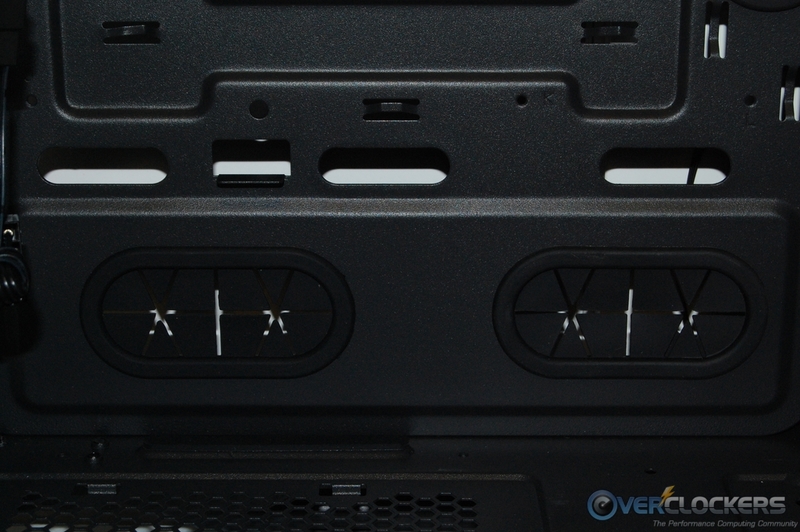 At the top, we can see the motherboard’s I/O shield opening, the included 120 mm exhaust fan opening, and three rubber protected pass through holes. 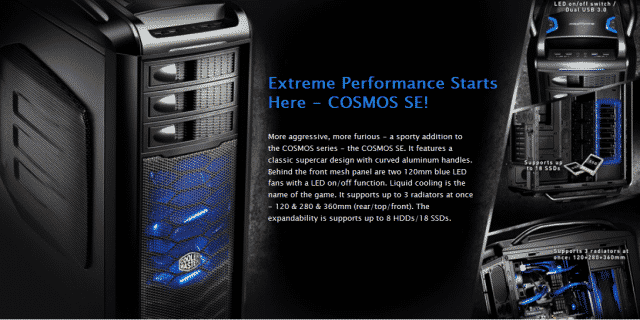 The top panel is home to the I/O functions the Cosmos SE offers. 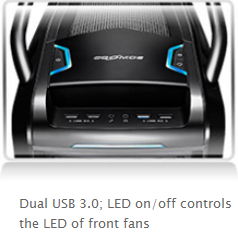 Here we have the power switch on the left and on the right, the front fan LED on/off and reset switches. 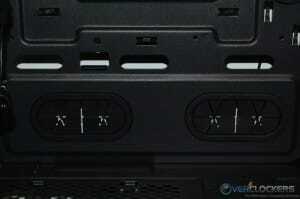 Just forward of the switches, we have two each USB 2.0 and USB 3.0 ports and the headphone and mic jacks. The rest of the top panel is made up of a mesh type construction that will provide filtration to any fans located under it. 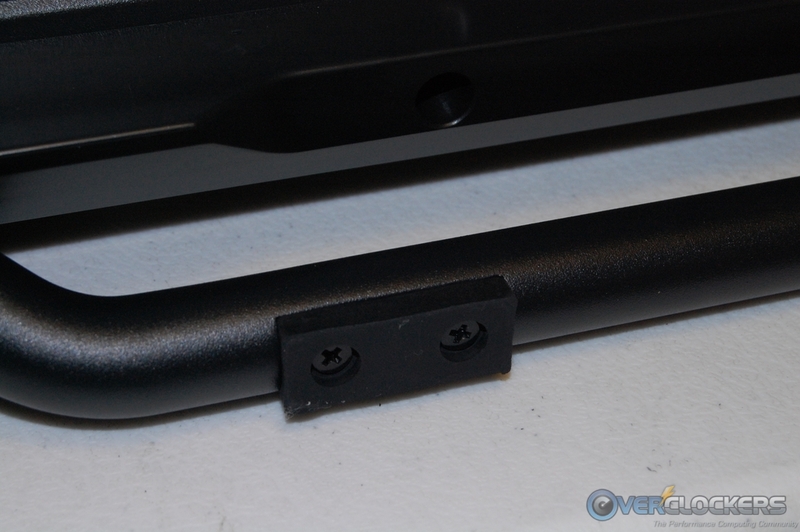 From this vantage point, we can also see the two top aluminum handles, which are extremely sturdy. These handles can easily handle the weight of the case in a fully loaded condition. They really are pretty impressive as far as handles go. 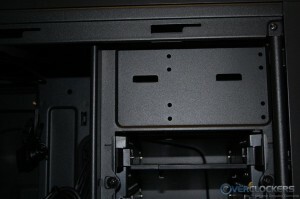 At the bottom, we have two slide out filters, but you’ll have to pop off the front panel to get the forward filter out. 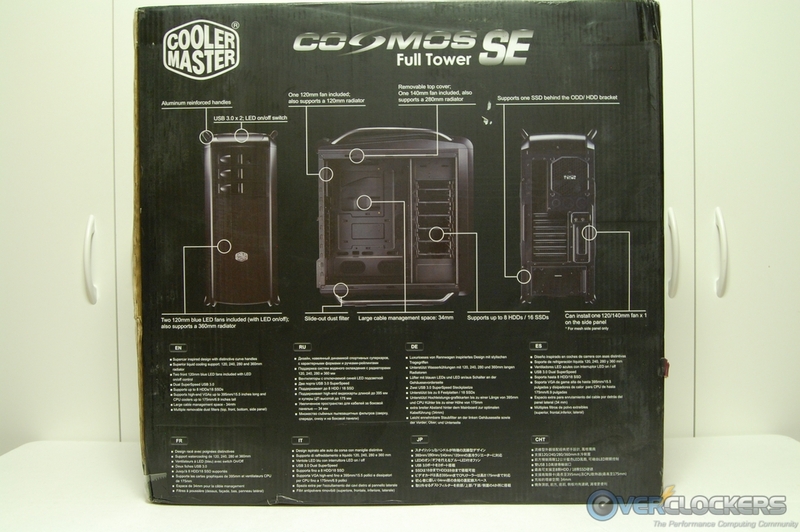 To keep the aesthetic theme of the two handles at the top, Cooler Master also use two bars at the bottom to act as the legs for the Cosmos SE. There are four rubber blocks attached to the bars, which provide surface protection and anti vibration qualities. 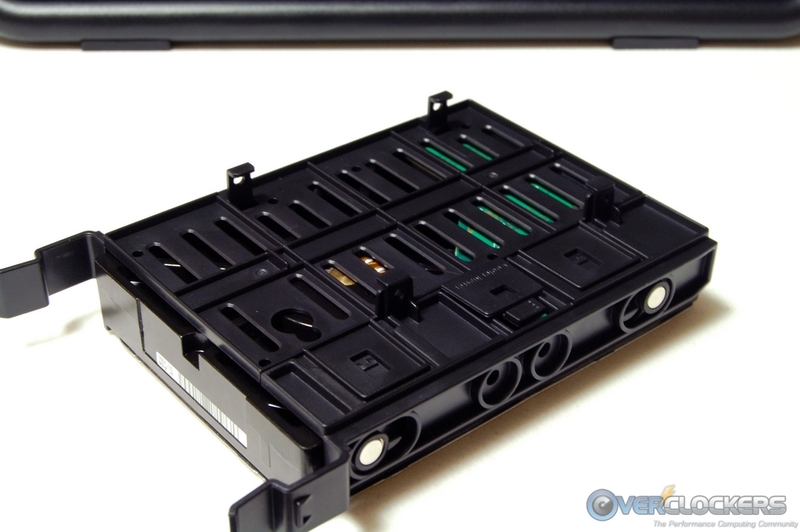 Now that you have an idea of the external looks and functionality of the Cosmos SE, let’s get the side panels off and have a look inside! 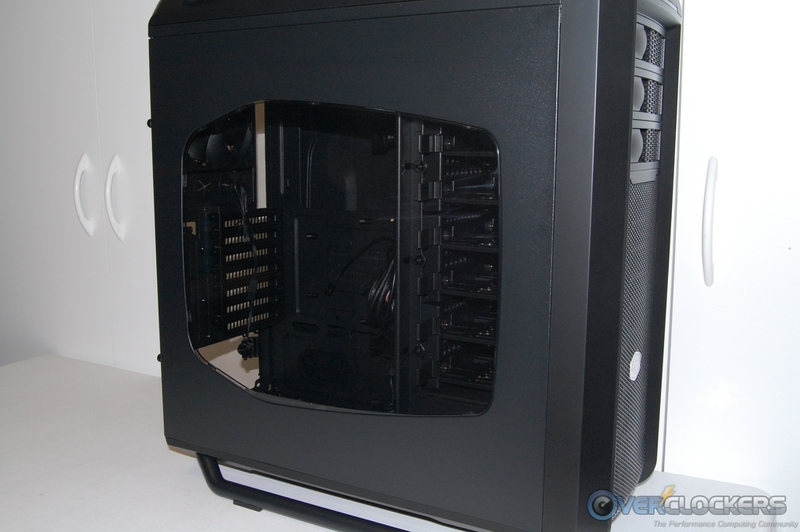 Inside the Cosmos SE, we find an all black color, and I mean all black. 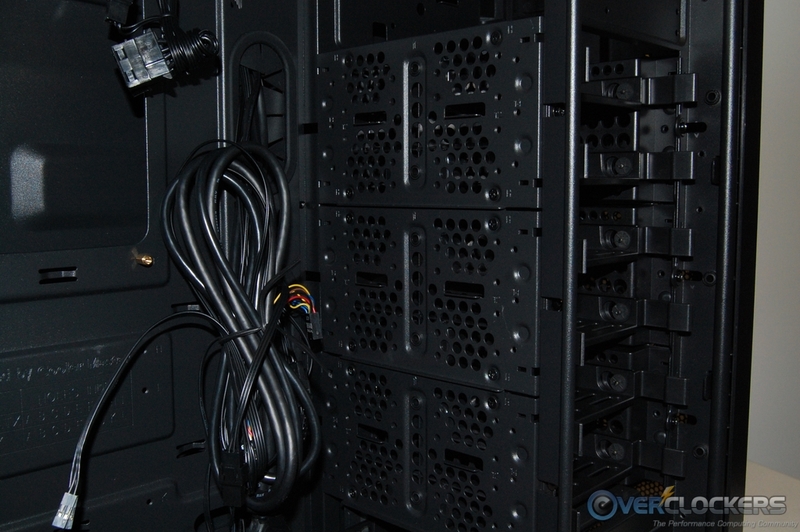 Drive bays, wires, expansion slot covers, fans, Molex power connectors, rubber grommets….. Yep, completely black! 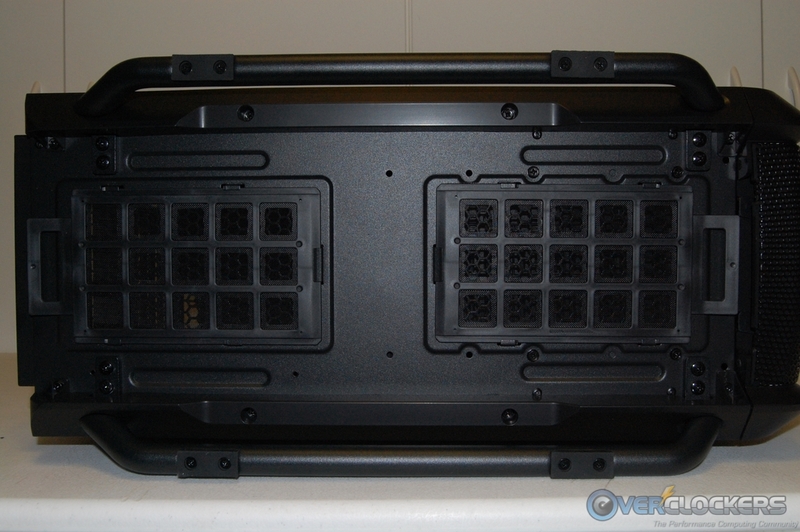 Along the bottom-rear of the case, we have the PSU ventilation area and the holes to mount the PSU. It’s hard to tell by the picture, but the PSU mounting holes are actually part of a removable bracket that you install on the PSU before sliding it in place. 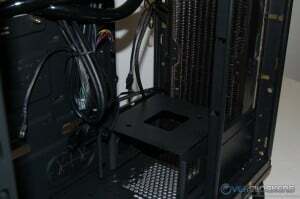 This actually makes the back of the PSU sit slightly outside the back of the case. 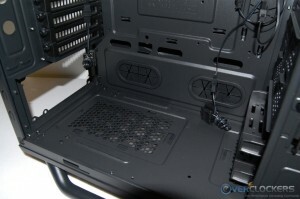 There are two rubber strips at the bottom for the PSU to rest on, which should help diminish any noise or vibrations. 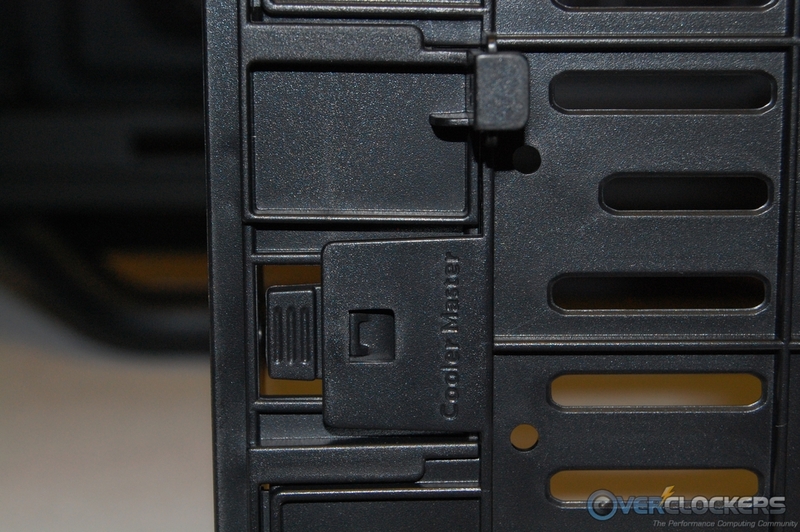 Higher up the back of the case, we come to the seven ventilated expansion slot covers, which are held in place by thumb screws. 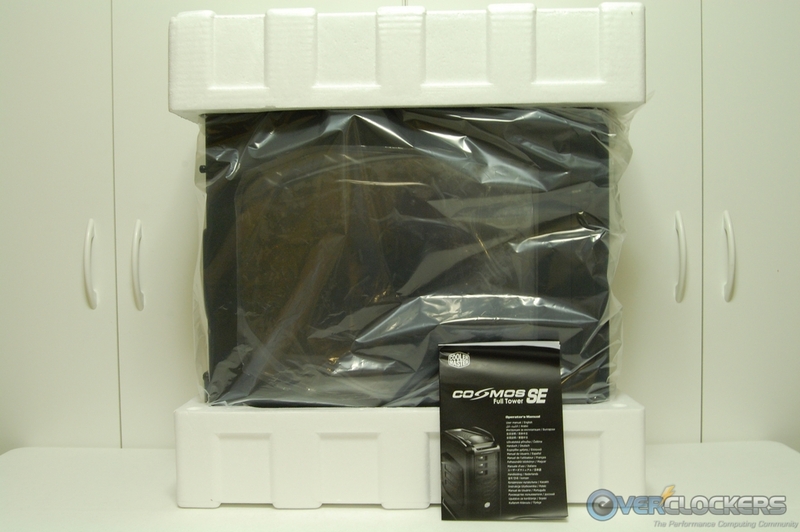 Above that, we come to the included Cooler Master branded 120 mm exhaust fan that operates at a maximum RPM of 1200 and 17 dBA. Under the top deck is another included fan, this time a 140 mm Cooler Master branded fan. 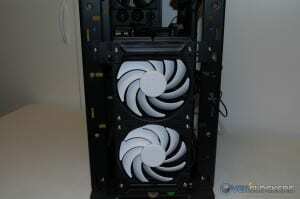 This fan also operates at a maximum 1200 RPM at 19 dBA. 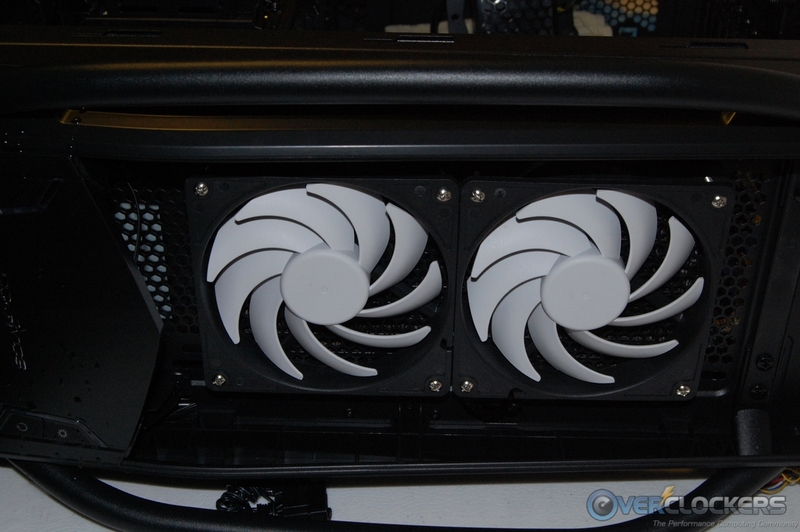 From this angle, you can also see that the area supports two 140 mm fans or two 120 mm fans. 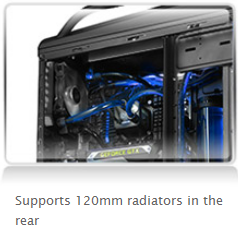 If you plan on using a radiator in this location, either a 240 or 280 mm will fit. 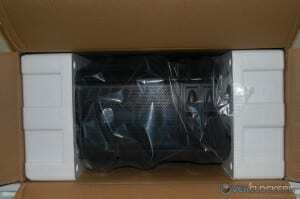 You’ll want to relocate the fans above the deck when installing a radiator here. 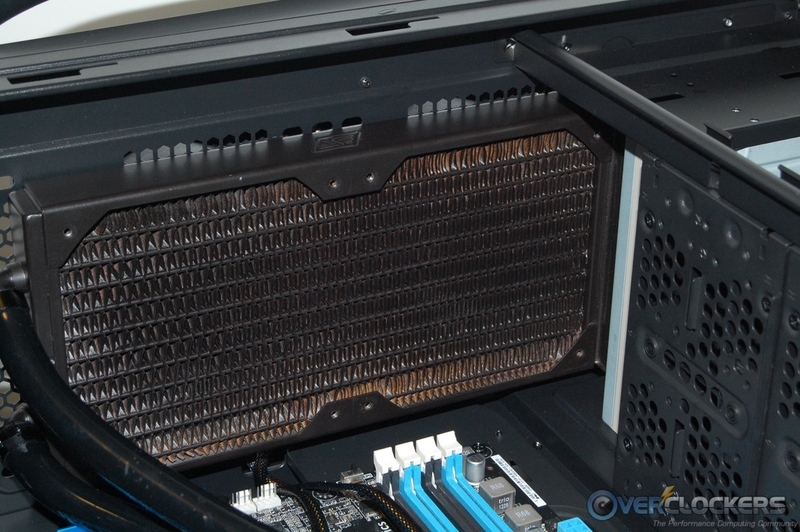 There is plenty of room under the top panel for fans, as you’ll see momentarily. 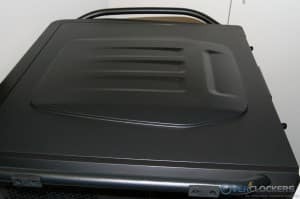 With the fans installed above the top deck and under the top panel, you can fit radiators up to 38 mm thick below the top deck. 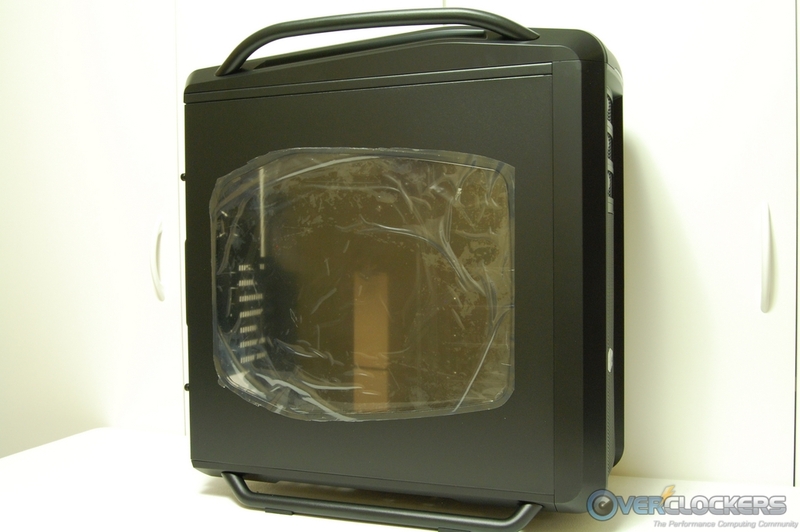 Removing the top panel to access the fan mounting options only requires removing a thumb screw at the back of the case and sliding it off. As you can see, there is lots of room here for fans; and the mounting holes are slotted to accommodate radiators with odd fan spacing. 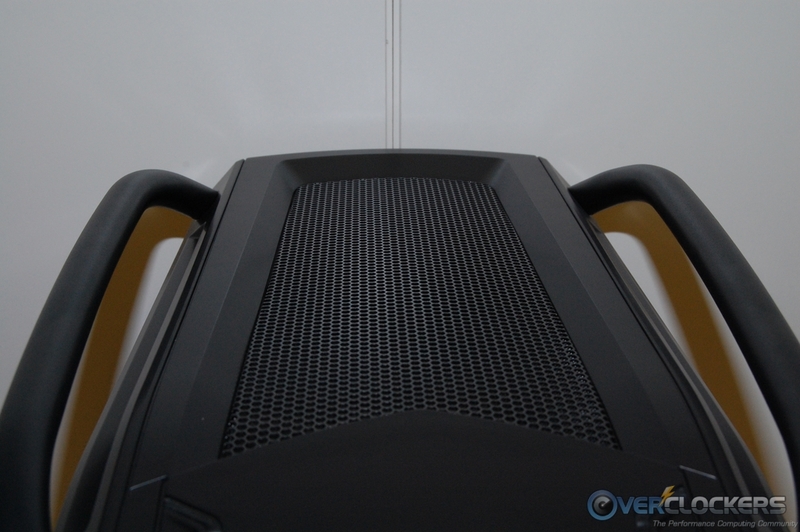 A 38 mm thick fan will only work in the forward most position, so for dual fan radiator setups you’ll be limited to using 25 mm thick fans. 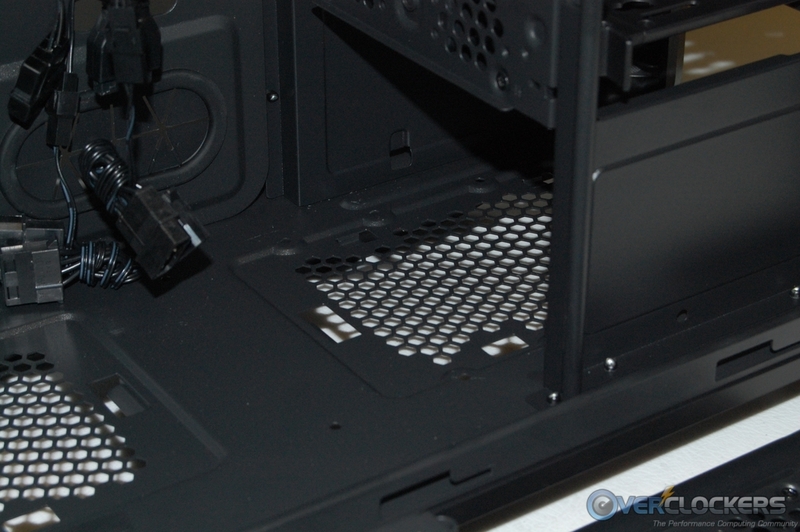 As I was putting the system together, I performed a test fit of the Swiftech H220 to give you an idea of what a 240 mm radiator and fans look like when installed. It easily fit with room to spare. 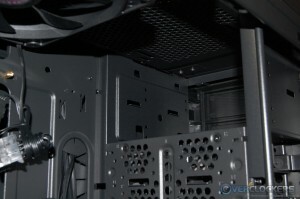 Moving over to the right side of the Cosmos SE, we have a lot going on with the drive bays and their configuration possibilities. 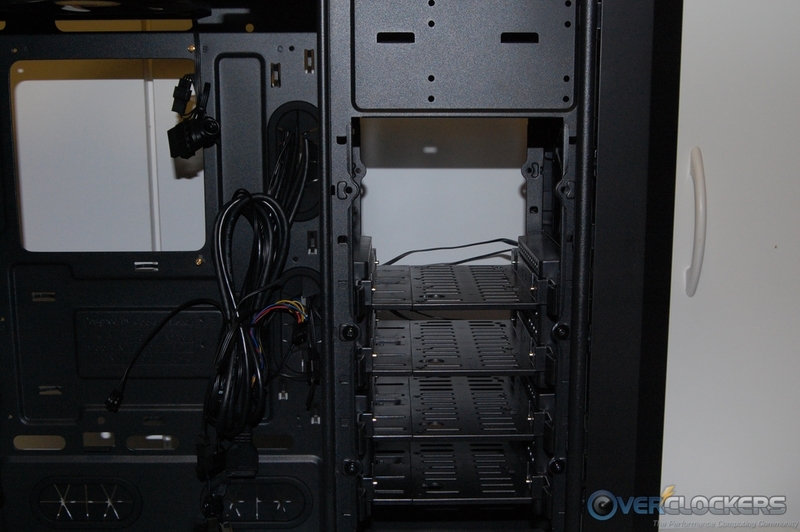 At the top, we have two available 5.25″ drive bays. You can re-work the upper 3.5″ cage to accept a third 5.25″ device if needed. 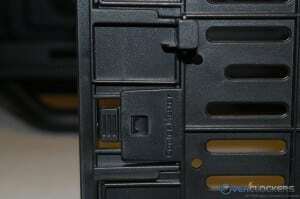 In a return to the old school method of drive retention, screws are used to secure 5.25″ devices to the bays. 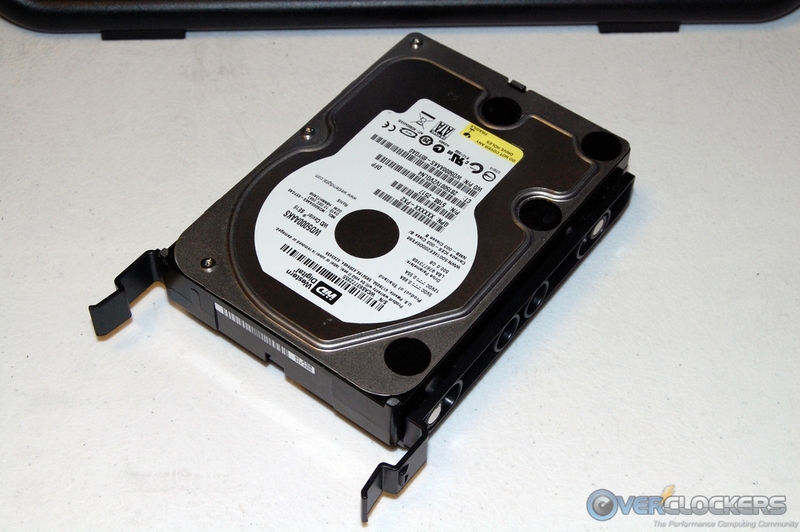 The three upper HDD cages consist of two removable sides per cage and can hold up to six 3.5″ HDDs. You can remove any of the cage sides independent of the ones above or below them. 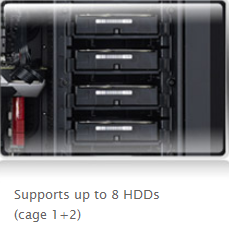 So, basically this means you can use the three HDD cages in any combination you wish, or none of them at all. You can even relocate the cage sides to change the direction that the HDDs are installed. The center portion of each cage side is removable and will make it usable for accommodating that third 5.25″ device, if needed. 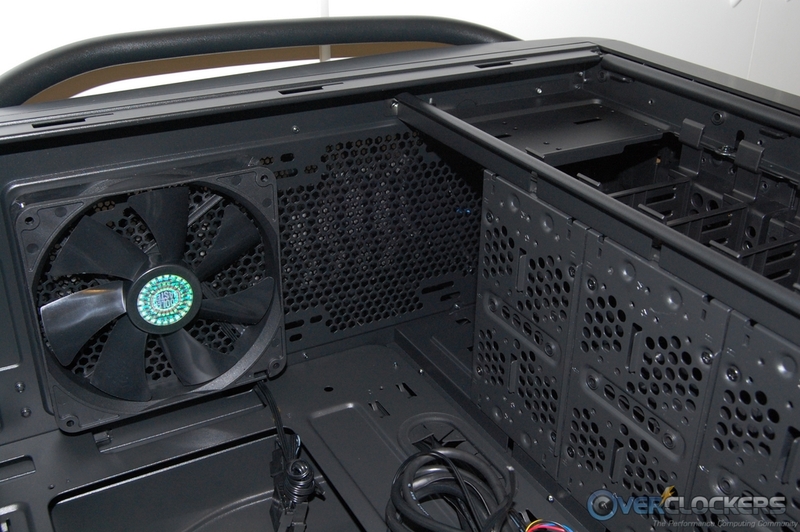 If you leave the upper three cages in their stock configuration, you can install two more 120 mm fans on the interior side of them. 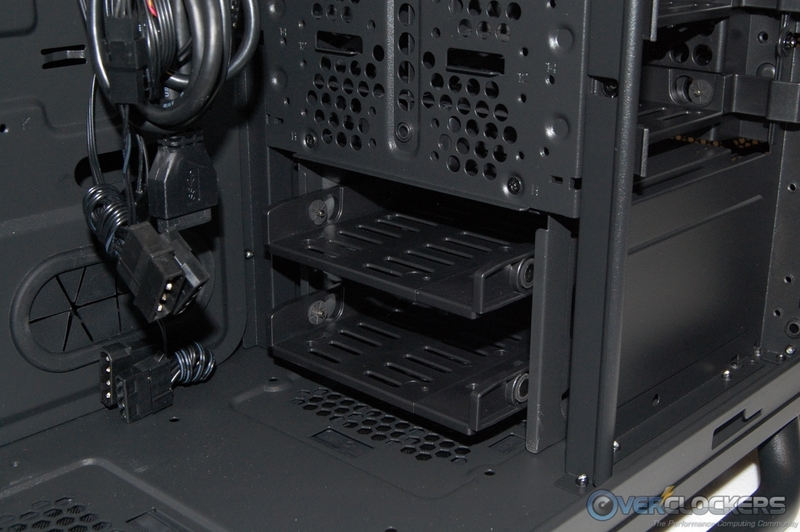 There is a fourth HDD cage located at the very bottom that holds two more drives. This cage is made from the more traditional bracket style, but it can be moved back to provide additional room for a front mounted radiator. 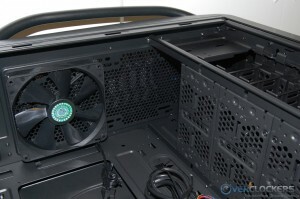 It can also be completely removed if desired, but unfortunately, no provision was made to install a fan in its place. 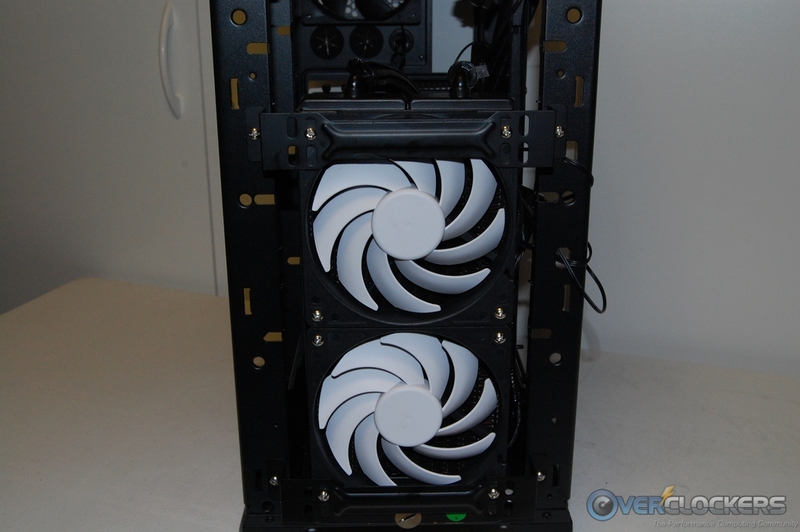 I tried a 120 mm and 140 mm fan, but no hole pattern lined up correctly. 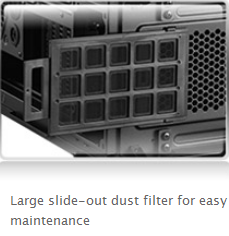 This is a pretty odd design choice, especially when you consider there is a filter covering the opening under the HDD cage. 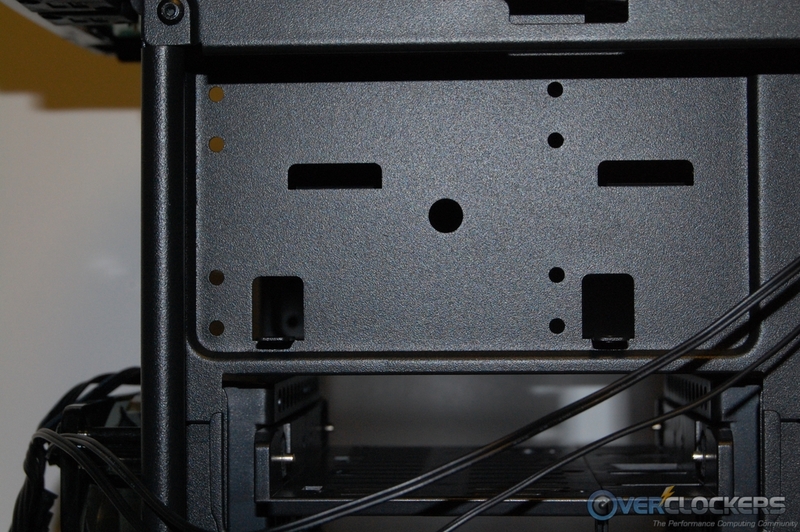 I went ahead and removed the sides that make up the uppermost HDD cage, which will give you a visual of what the area looks like if you decide to start removing cages. 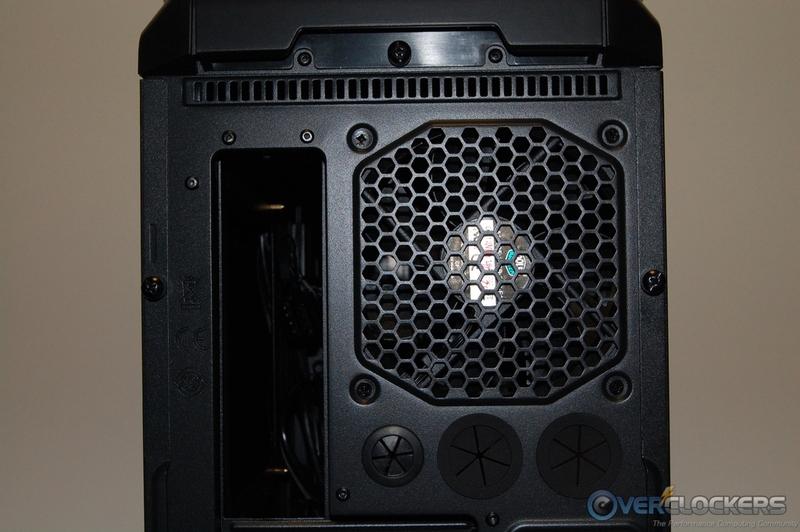 Moving around to the front with the panel and 5.25″ bay covers off, we get a good look at the two blue LED 120 mm fans. 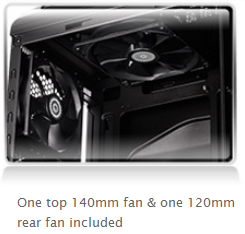 You can replace the two 120 mm fans with a single optional 140 mm if preferred. 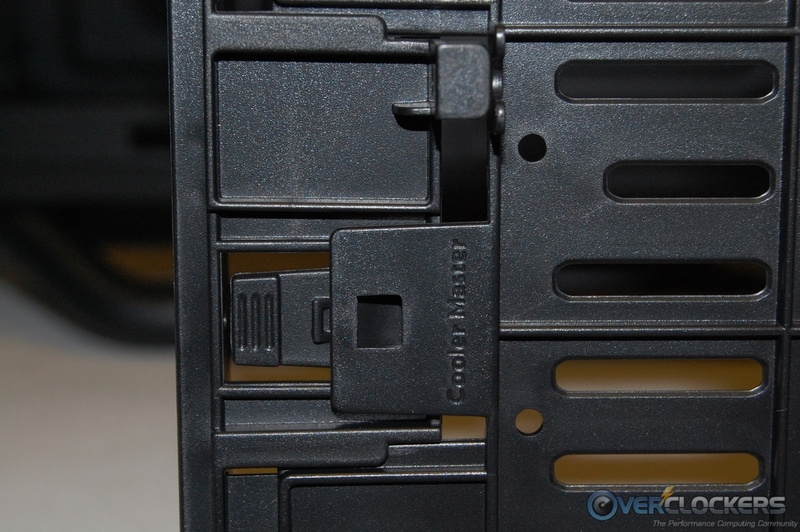 Not everything is a rosy picture here though, as the bottom 5.25″ drive bay cover blocks airflow to the upper fan quite significantly. 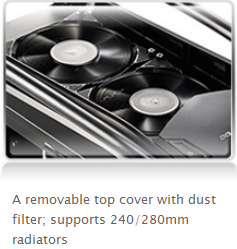 If you install a 360 mm radiator in the front, you can expect the same blockage to occur on the upper fan. It also becomes clear that if you decide to make use of the third 5.25″ drive bay, the upper fan will have to be sacrificed in order for the drive to be installed. 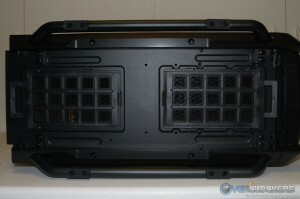 The front of the Cosmos LE can support 240 mm, 280 mm, and 360 mm radiators. 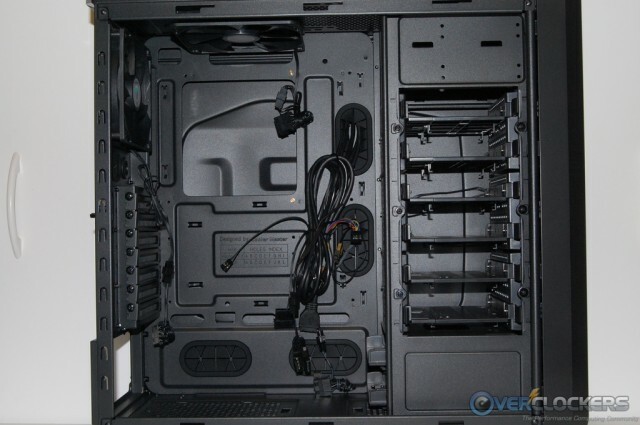 You will have to sacrifice the use of the upper three hard drive cages to put a radiator here. You’ll also have to slide the very bottom HDD cage at least one position toward the rear, which creates a problem of its own that I’ll explain later. 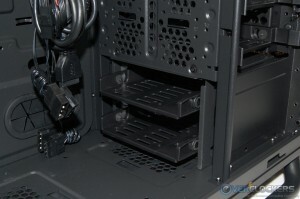 With a little extra effort though, the bottom HDD cage can still be used. 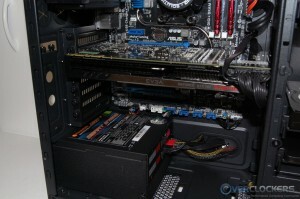 As you’ll see shortly, you can also install up to two SSDs on the other side of the drive bay area. 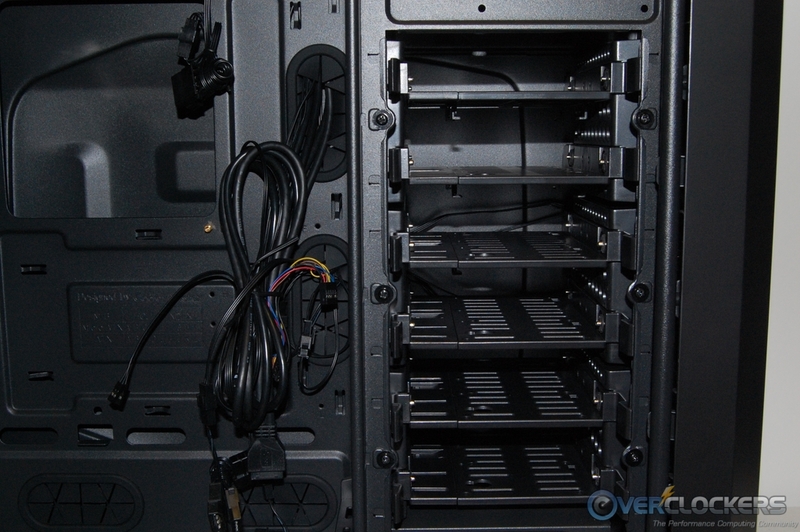 The point being, you still have a fair amount of drive installation options even with the upper HDD cages removed. 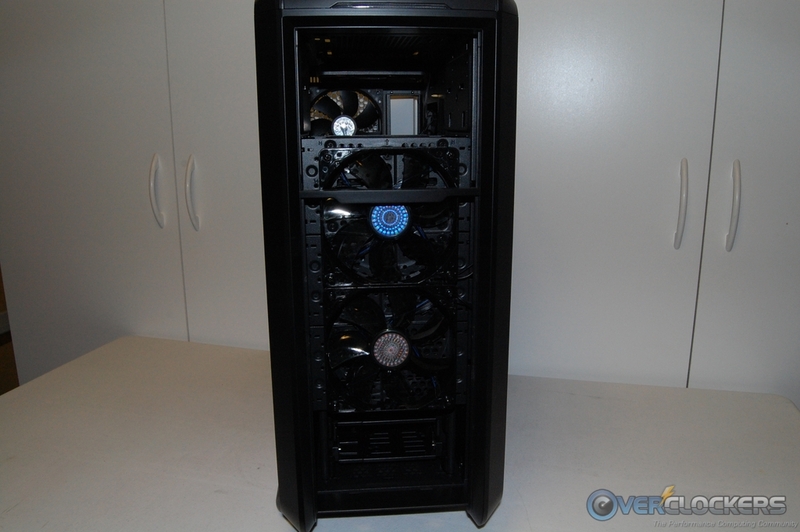 Below are a few pictures of the Swiftech H220 (240 mm Radiator) installed in the front location. 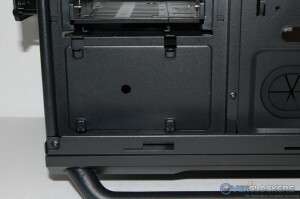 If you move the lower HDD cage one position towards the rear, you could even get a push pull setup in there. 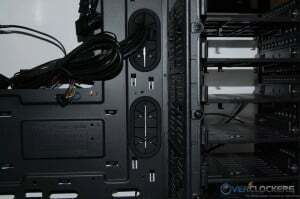 If you need even more room, you can move the cage one additional position towards the rear. 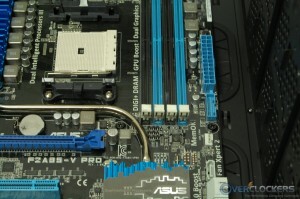 The motherboard tray features a large cutout for accessing a CPU cooler’s backplate and lots of cable pass through holes. 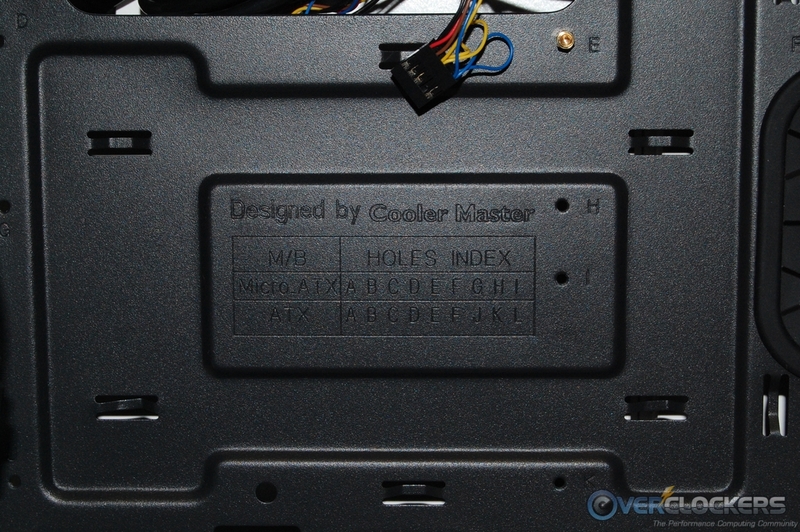 Cooler Master also stamped an index of what standoff holes to use for mounting your motherboard. Along the right side of the motherboard tray are two rubber protected pass through holes in a vertical position. 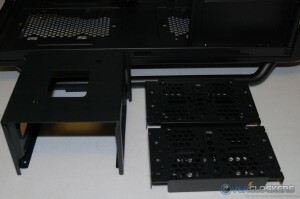 Along the bottom are two more rubber protected pass through holes in a horizontal position, but only the forward one will be usable once the PSU is installed. The rear pass through hole in this location will be completely blocked by the PSU, and the side wall of the PSU will be right up against it, rendering it unusable. 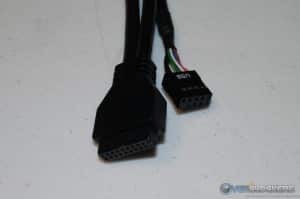 There are numerous other smaller cable routing holes located at the bottom and top of the motherboard tray that are great for fan wires and the PSU’s 8-pin 12V CPU power lead. CPU coolers up to 175 mm tall and video cards up to 395 mm long are supported. 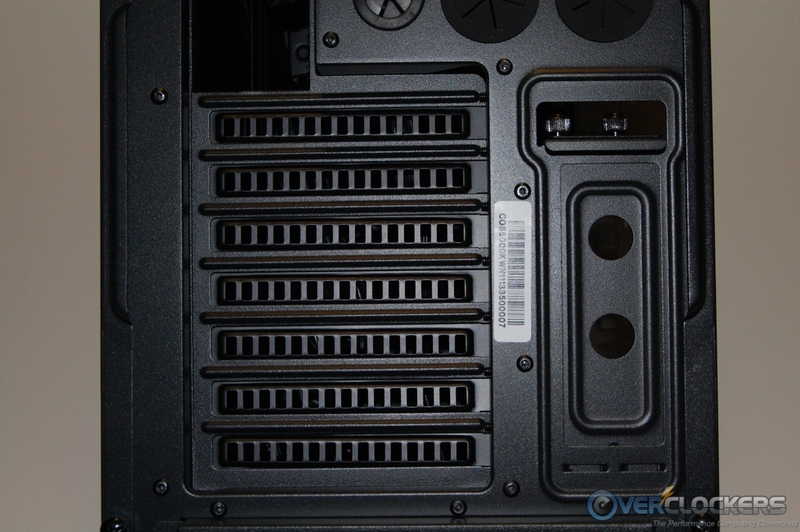 The longest of video cards will require removing the center HDD cage for clearance, but they will easily fit once that is done. 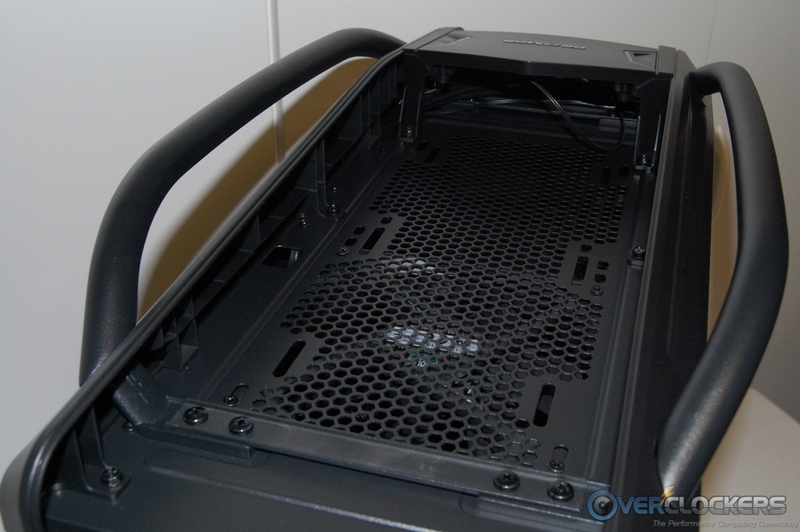 Turning the case around to have a look behind the motherboard tray, we find there is a large amount of room to tuck cables away. I measured 7/8″ at the narrowest point, but the areas that match the bulged out portion of the side panel have just over 1-1/4″. 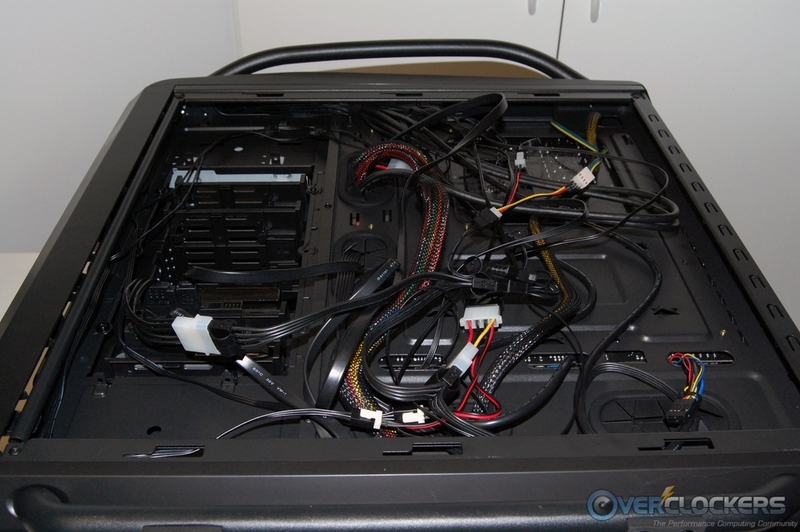 Suffice to say, I think that’s plenty of room to route a lot of cables! At the top and bottom of the drive bay area, there are provisions made to install a 2.5″ HDD or SSD. 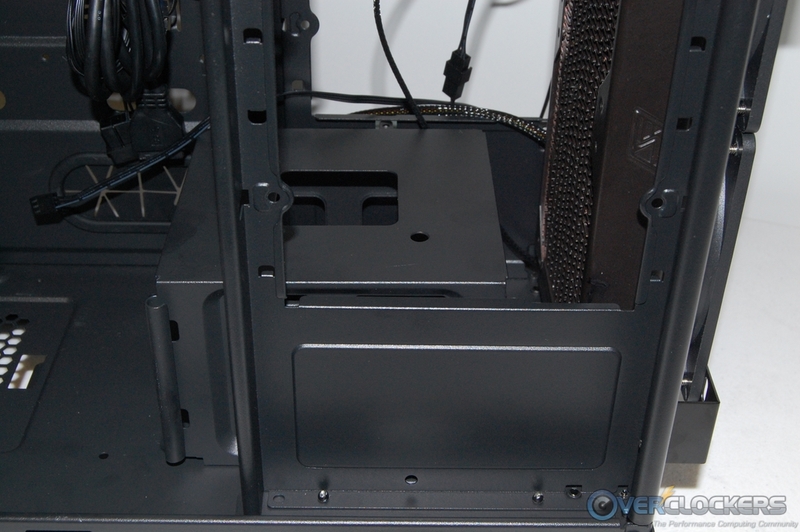 I really like the location of these SSD mounts compared to being located behind the motherboard tray as I’ve seen on other cases. 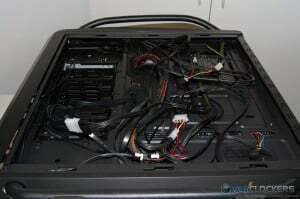 The case wiring is pretty standard fare for most cases now days. 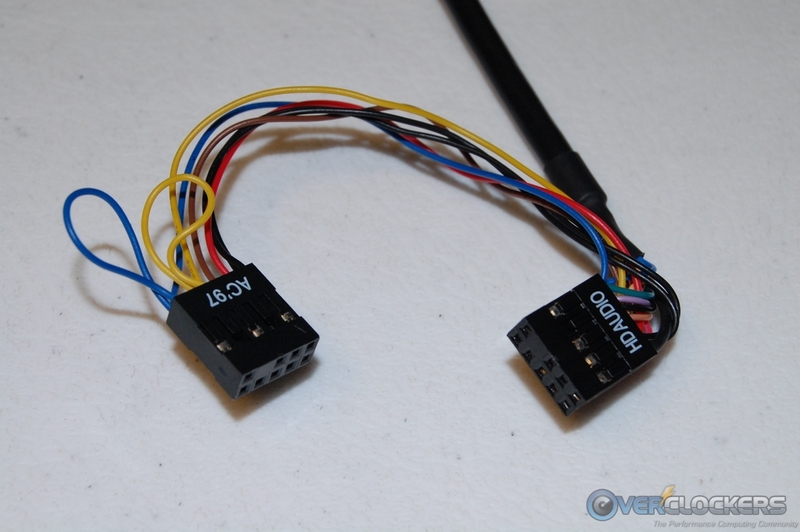 Worth mentioning is the inclusion of 3-pin to 4-pin Molex adapters for each of the included fans. The wiring is mostly made up of flat ribbon style cabling or a round sleeve design that looks very nice. Now that we’ve been through the Cosmos SE inside and out, let’s throw a system together and see what we come up with! 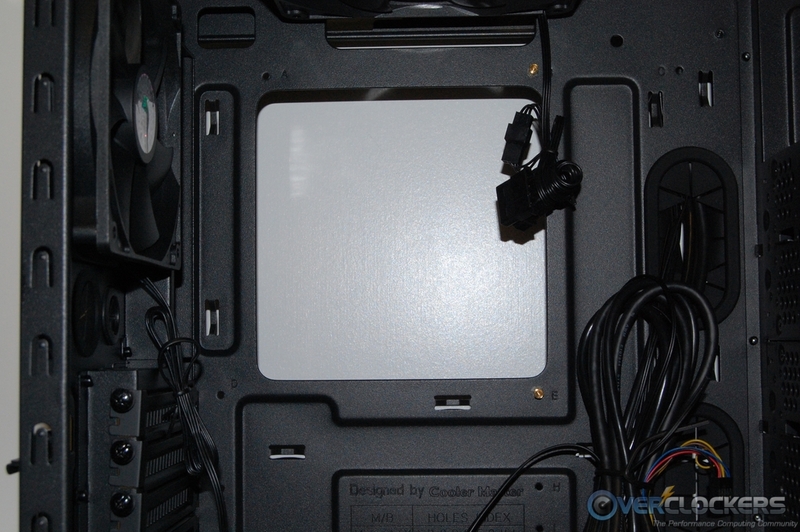 Because I’ve already illustrated radiator installation at the top and front locations, I decided to use the Zalman LQ320 AIO cooler at the rear exhaust fan location. This way you’ll now have an idea of radiator installation at all three possible locations. 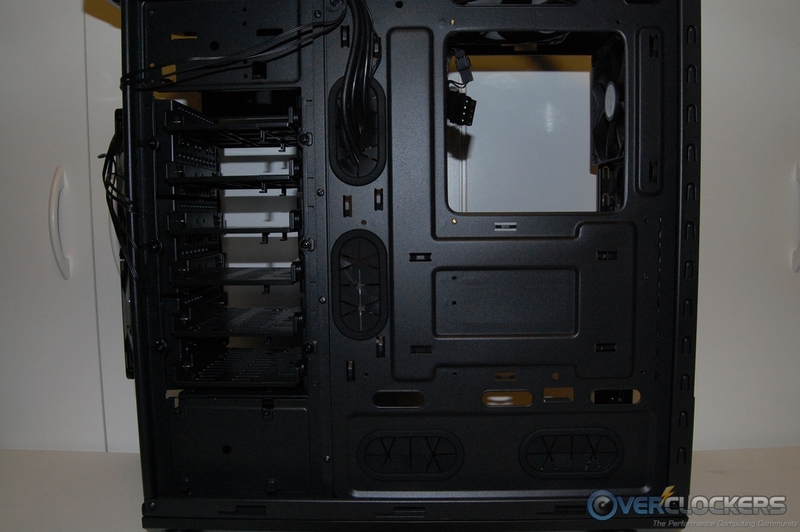 After laying the motherboard in place, I noticed it covered half of the vertical pass through holes; but luckily as the build progressed, I was still able to get the needed wiring through. 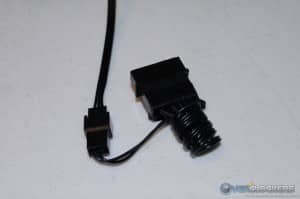 I didn’t care much for the sharp bend in the SATA cables needed to route them from the motherboard’s SATA connector through the pass through holes. I wouldn’t expect these sort of issues on a case being advertised as a full tower. Next, I installed the Zalman LQ320 AIO cooler. 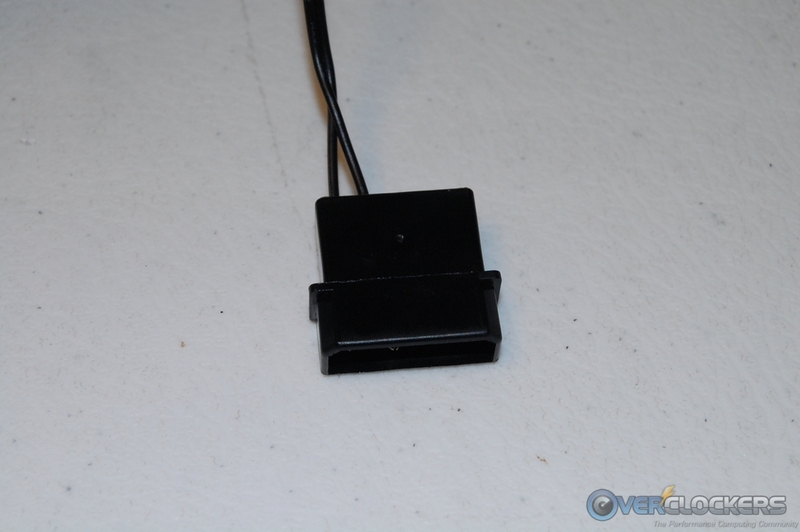 Other than having to move the stock fan attached to the underside of the top deck, installation went off without a hitch. 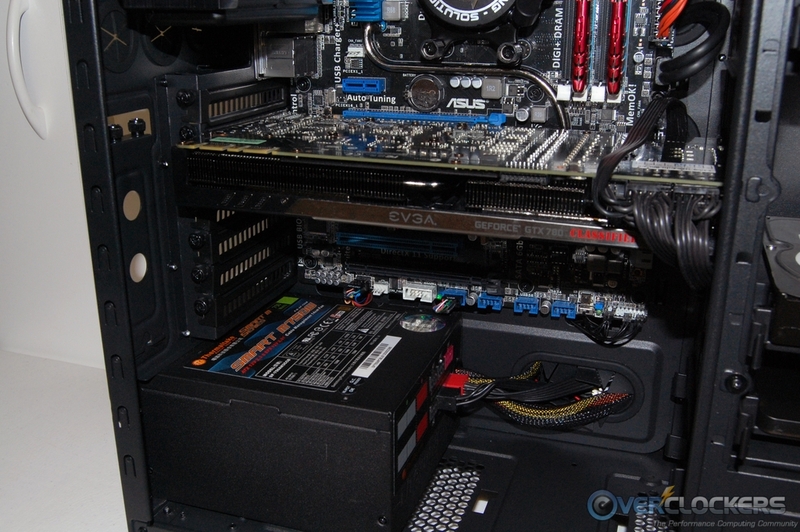 You could even move that stock fan above the deck and under the top panel if you want it entirely out of the way. The hard drive trays are a very unique design and well thought out. 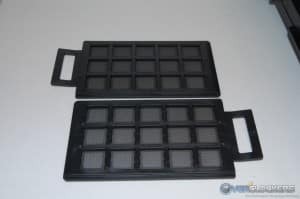 The trays actually expand by releasing a lock tab, allowing you to set the drive in place and then collapse it tight against the drive. Each tray has brackets built into the bottom for 2.5″ drive installation. What this means is that each tray will accept two drives. 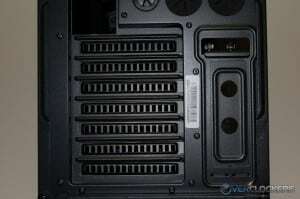 You could use the top of each tray to install a SSD as well. In fact, Cooler Master claims 18 total SSDs can be installed if needed, and they speak the truth! 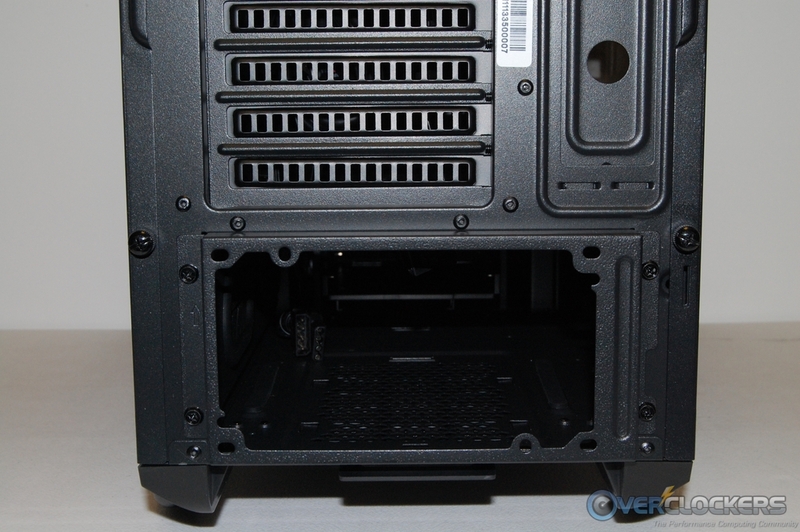 While working with the hard drives, I noticed the space between the front of the PSU and the lower hard drive cage was a bit cramped. As long as the cage is in the forward most position, removing and replacing the HDD trays is easy. 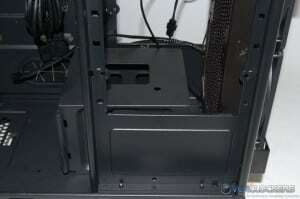 However, if you move the HDD cage back just one position, you can no longer get the trays back in. The problem is obviously compounded if you move it further back to the second position. 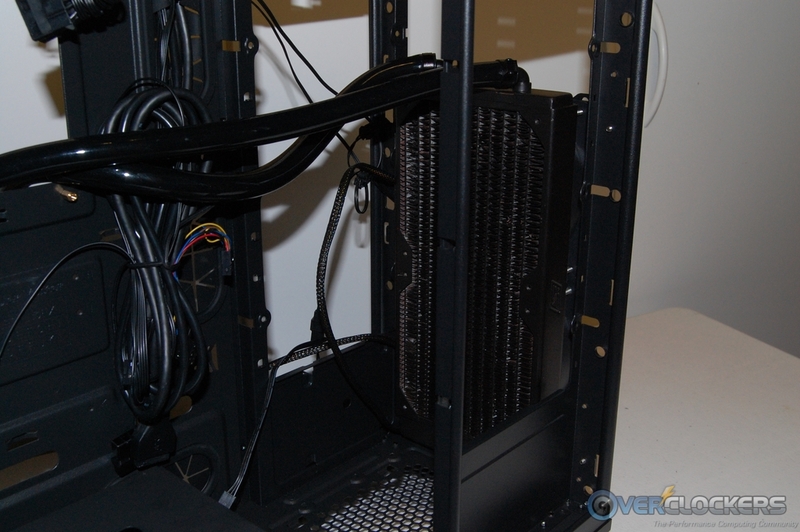 The Thermaltake PSU I used in this build wouldn’t be considered an overly long unit by any standard, so you’re most likely to run into this issue regardless of the PSU you use. 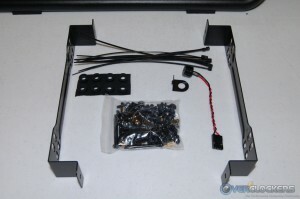 I bring this matter up because in most cases installing a radiator at the front will require moving the cage back at least one position. 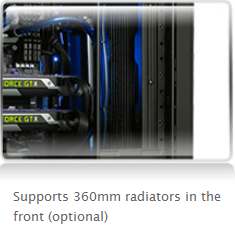 If you remember our earlier discussion, installing a radiator up front requires sacrificing all the other 3.5″ bays. 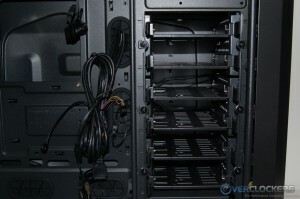 So, what will have to be done in this situation is to remove the HDD cage completely, install the HDDs in the trays, put the trays back in the cage, and reinstall the cage in the chassis with the drives installed. 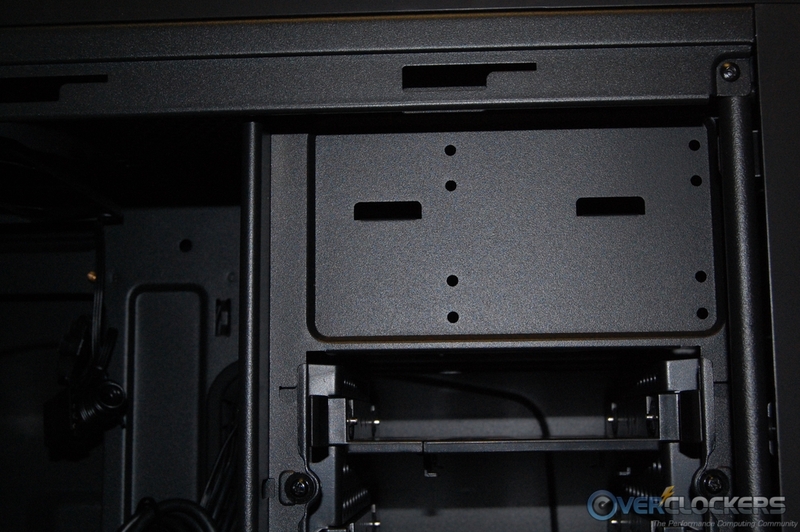 Again, this isn’t something you’d expect to see in a full tower case. Moving on to the remainder of the system build, it was just a matter of installing the HDDs, Rom Drive, and the video card. 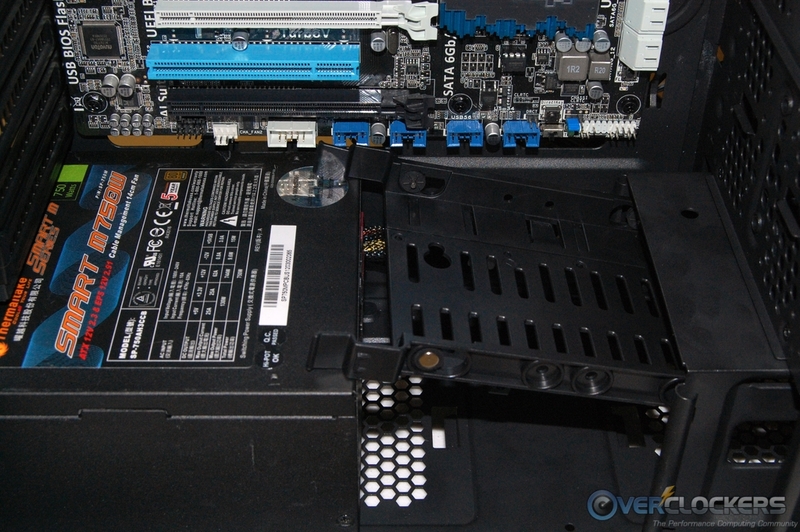 The GTX 780 video card came within a whisker of fitting without having to remove the center HDD cage, but in the end it had to be removed. That’s not a big deal as there are still four more bays available there. 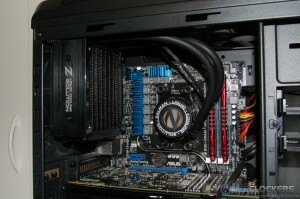 Once everything was installed, quite a bundle of wires needed to be dealt with behind the motherboard tray. 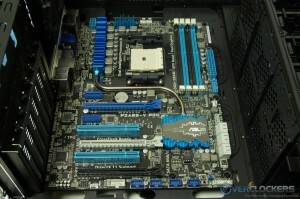 The mess of wires proved to be no match for the large amount of room behind the motherboard tray and side panel. Getting the panel back on was a snap. 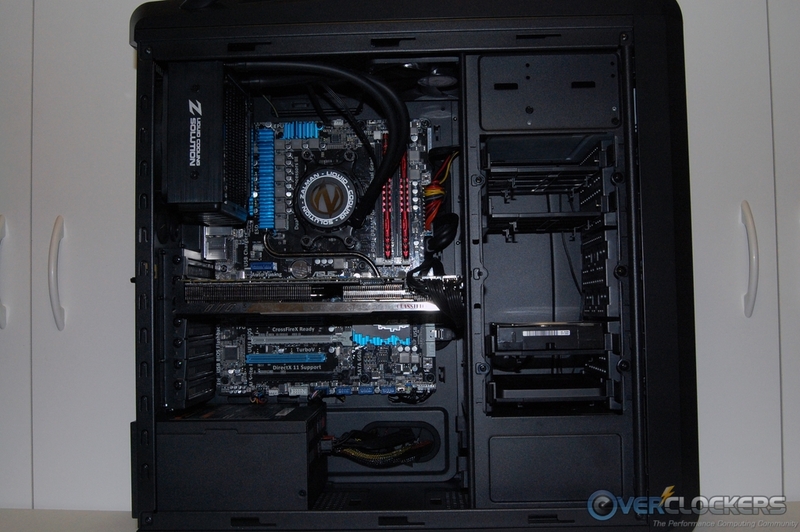 Once everything was installed, we ended up with a pretty nice looking system in the end. 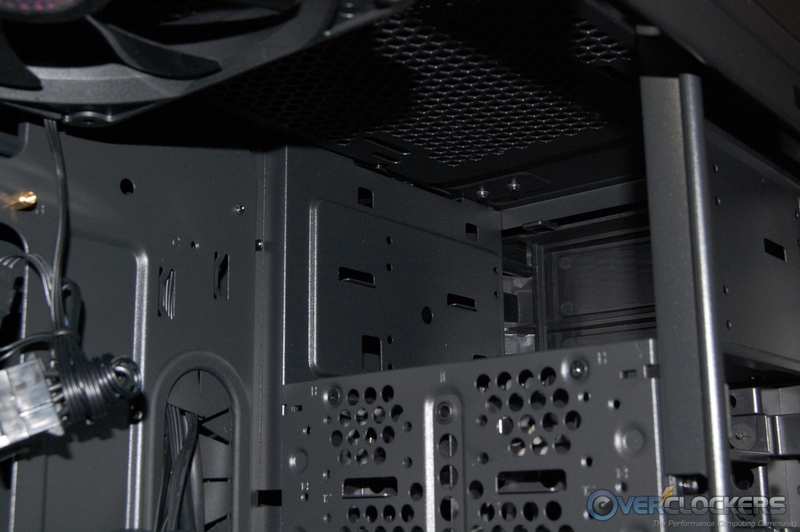 Completed Build – Buttoned Up! As with most products, there are good things and bad things. The Cosmos SE has some very nice features that will appeal to a lot of users out there. 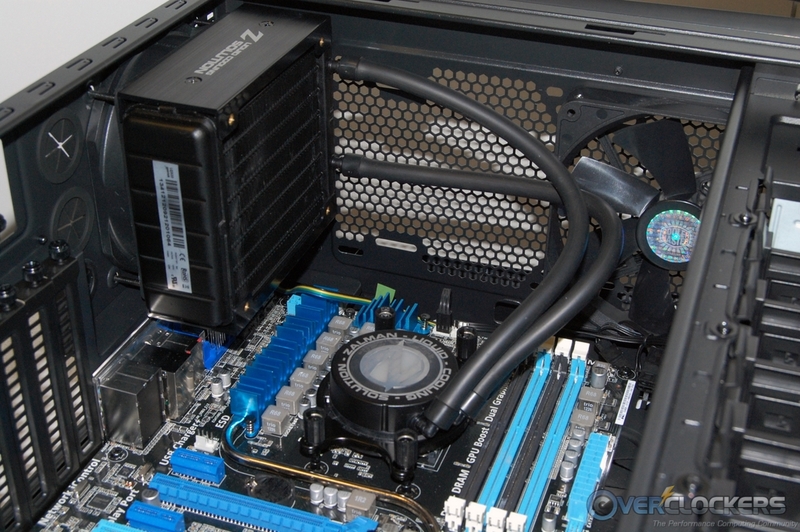 The abundance of water cooling options are a good thing, but unfortunately, the front mount option comes with sacrifices and design miscues. 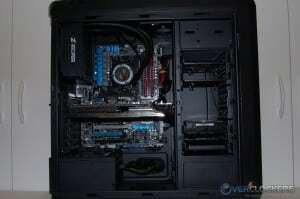 The water cooling options at the top and rear are easily executable and well designed, good job there. Most of the issues I found with the Cosmos SE were related to the design of the front of the case. 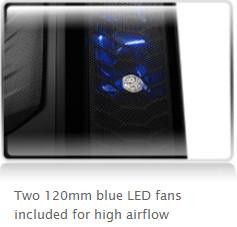 Blocking half of a fan with a non ventilated bay cover is not a good design choice by any stretch of the imagination, especially if that fan is mounted to a radiator. The bottom-most HDD cage design is another area of concern when installing a radiator at the front and in most scenarios will result in a difficult task for installing hard drives in it. 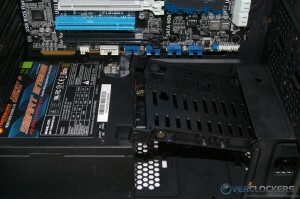 Removing the bottom HDD cage should afford the opportunity to mount a fan in its place, but in this case it does not. On the cable management front, there is more than adequate room behind the motherboard tray to tuck away wires, which is is a great feature. 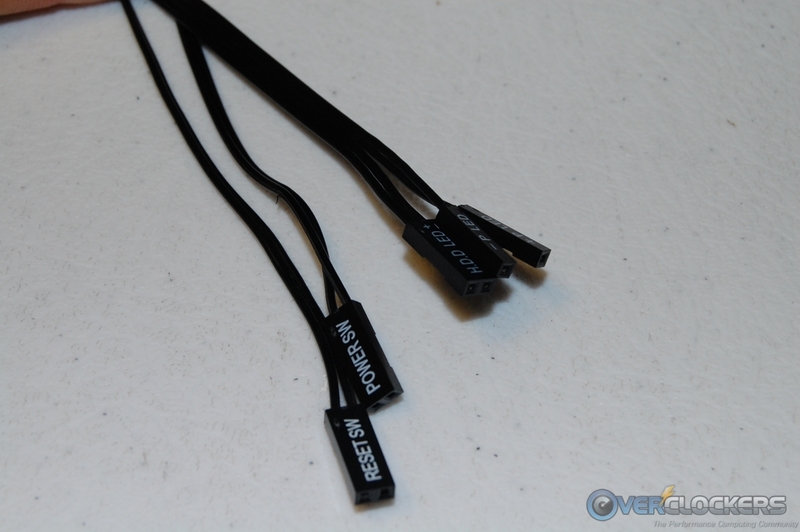 Unfortunately, because an ATX motherboard covers half of the vertical pass through holes, routing cables through them is tight. SATA cables have to be bent way too sharp to use the pass through holes and that can lead to data corruption. 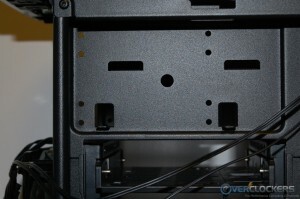 I’m not quite sure what the plan was for the rear horizontal pass through hole at the bottom of the case. 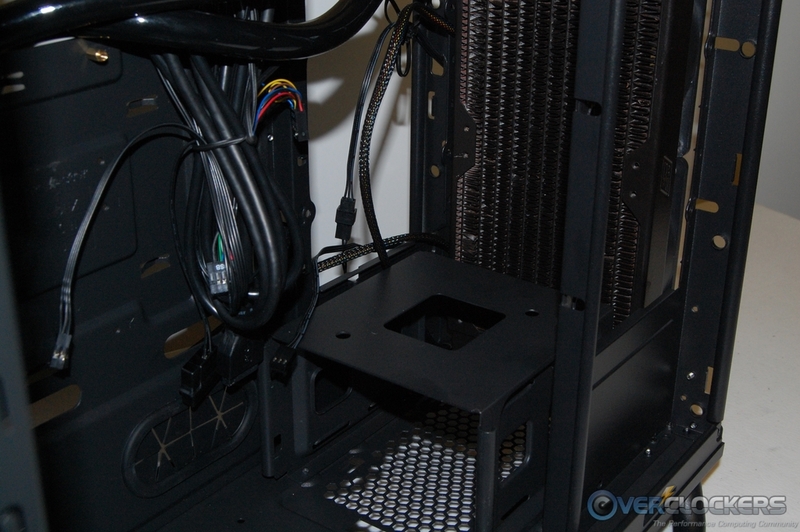 It gets totally blocked when the PSU is installed – a spare rubber grommet holder maybe? I love the aluminum handles at the top and bottom, they really make moving the system around a piece of cake. They also play a large role in the overall aesthetics, which I personally find to be quite appealing. Nothing to complain about in the looks department! In the end, I struggle with this case being marketed as a full tower design. I’m sure the dimensions meet the industry standard to be officially classified as such; but while working with the Cosmos SE, it never quite felt like it had a spacious interior. I completely understand the reasoning behind the decision to offer a downsized version in the Cosmos series of cases (think price and size), but I think Cooler Master tried to do a little too much with it. 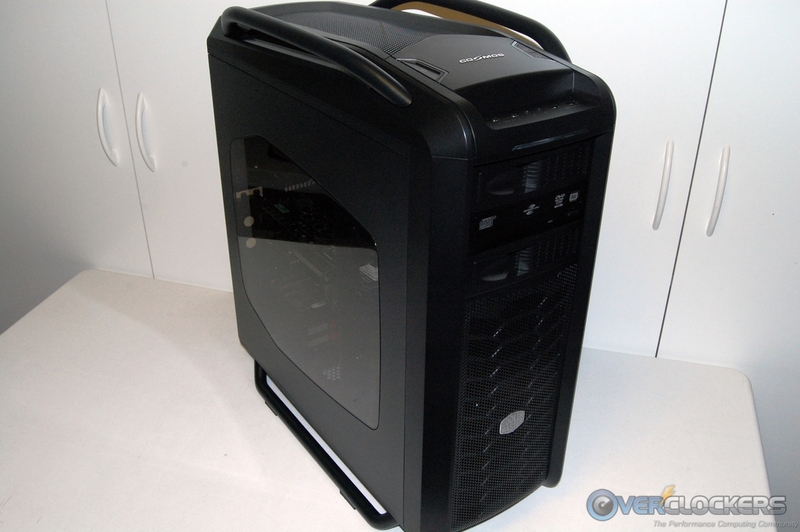 In my opinion, the root of all the problems I found with the Cosmos SE can be directly attributed to the design of the front of the case and more specifically, the radiator support there. 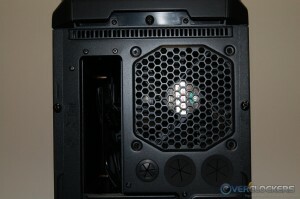 I won’t go over the problems installing a radiator in the front of case causes again, it’s well documented in the review. Had Cooler Master foregone radiator support at the front, the case is plenty big enough to design a 360 mm radiator option at the top. 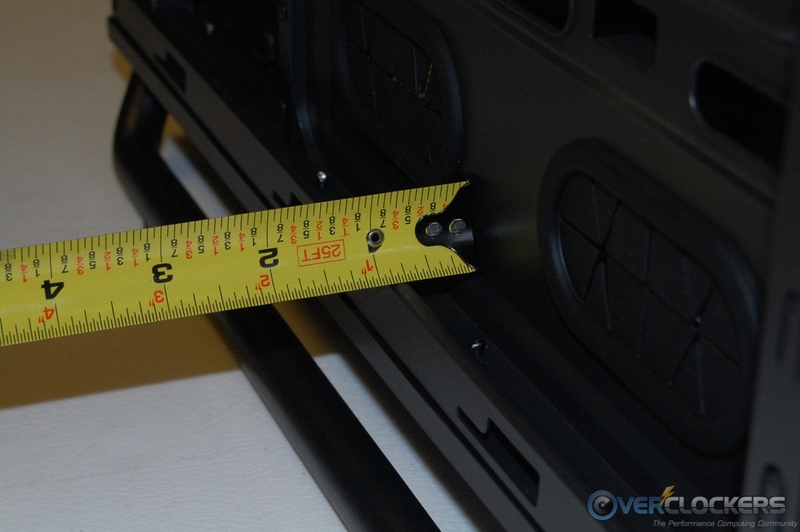 Additionally, this would probably allow enough space to enlarge the motherboard tray just enough to keep the motherboard from covering half of the vertical cable pass through holes. 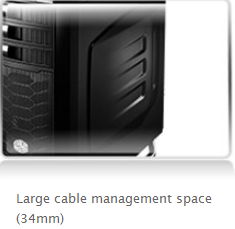 In a case this size, a 360 mm radiator at the top with the option for another at the rear exhaust fan is more than adequate. 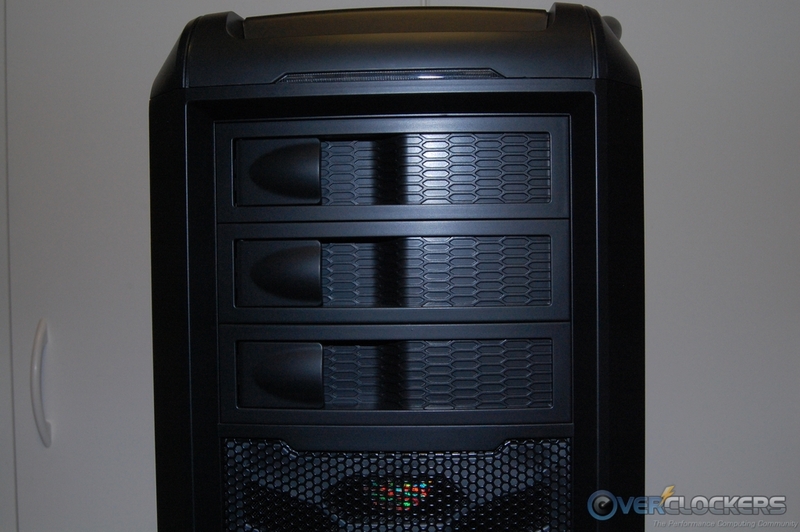 My guess is if someone truly wants to install three radiators in a case, they would most likely get a much larger full tower option. The MSRP on release day for the Cosmos SE is $169.99, which is a little high when I did some quick comparisons. 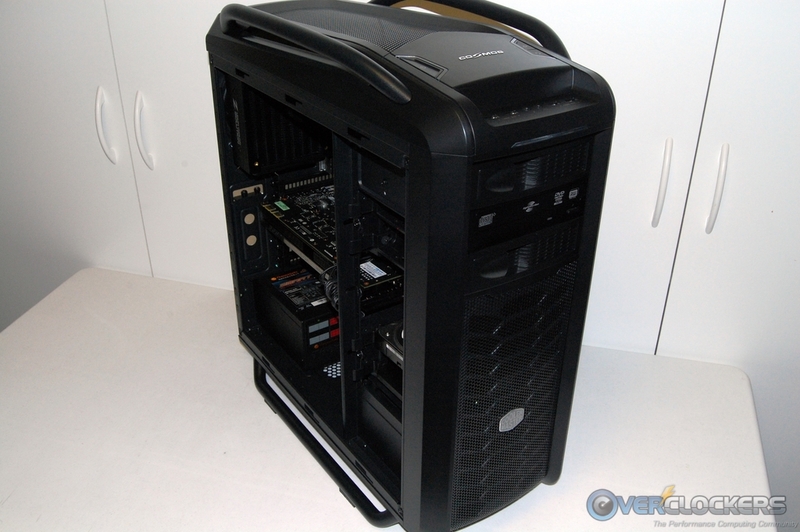 For example, the Fractal Design Define XL R2 costs about $40 less and supports up to four radiators, albeit nothing larger than a 280 mm. 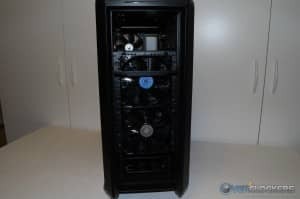 Thermaltake has a couple of competing cases in the A71 and Urban S71 that are more inline with the dual radiator design I mentioned, each costing $40 less. 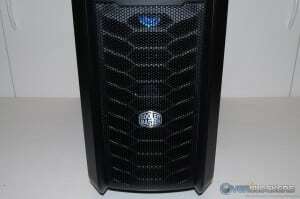 Cooler Master’s own HAF932 supports a 360 mm radiator at the top and is arguably their most popular case, it sells for $30 less. 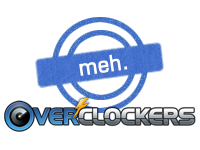 All told, with the design issues noted and a price a little higher than I’d like to see, it’ll have to be the “Meh” stamp this time around. Crappy design but it's a shame they didn't learn their lesson lmfao. Great review though, gonna read the Cosmos II's one next, didn't know yall reviewed it. 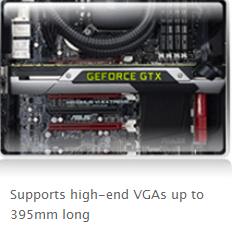 This is why Corsair is beating these guys. 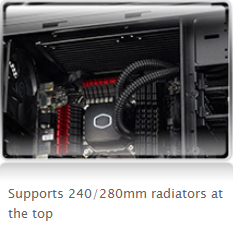 Only a 240/280 rad at the top? Fail.